Scotland’s educational links with China have been further established, following an agreement to establish a Confucius Institute at Heriot-Watt University – the first to specialise in business and communication. The Institute, the fifth Confucius Institute in Scotland, will aim to help Scottish companies to engage with China and increase the provision of Chinese language learning for business purposes. The new Institute will build on Heriot-Watt University’s well-developed China strategy to help forge new partnerships; attract more well-qualified students to study in Scotland and help foster joint research collaborations across Heriot-Watt University. The announcement was made during the First Minister’s meeting in Beijing with Hanban – the organisation that is charged with promoting Chinese learning and language across the globe. Heriot-Watt University, which already has expertise in applied languages, will launch an undergraduate degree in International Business and Management and Chinese Language in 2014. The First Minister with Heriot-Watt University Deputy Principal Professor Gillian Hogg and Madame Xu Lin, Director-General of Hanban and Chief Executive of the Confucius Institute Headquarters. This will form the core of the Scottish Confucius Institute for Business and Communication (SCIBC) although further development of degree programmes in Chinese will follow. Heriot-Watt’s Department of Languages and Intercultural Studies in the School of Management and Languages, already runs Chinese teachers’ programmes and expanding this CPD activity is an important part of the initiative. 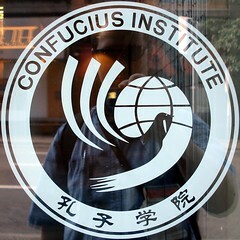 “We look forward to working together with existing Confucius Institutes in Scotland and throughout the worldwide network. “Given the increased business collaboration between Scotland and China and Heriot-Watt’s leading expertise in business and communication, we believe it is good timing to set up a dedicated Confucius Institute to meet the needs for the business, cultural and languages exchanges in Scotland. A ‘Scotland China Exchanges Bridge’ will also be set up to facilitate the joint conferences, joint research collaboration, joint funding application and partnerships with Chinese universities.